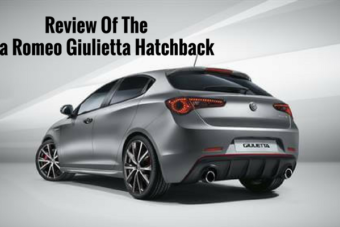 Looking for an objective review of the new Alfa Romeo Giulietta Hatchback? OSV has got you covered from engines to lease deals. The Italian’s are at their best when they’re making pizza, pasta and stylish cars that make the school run look cool. And the brand new Alfa Romeo Giulietta Hatchback is everything we’ve come to expect from the experienced brand with more pizzazz than most. It’s the doyen of dazzle. If you want some Italian flair to go with your everyday driving experience, this Mediterranean-inspired hatchback has looks that can kill. The Giulietta has indeed always been a handsome car. Thanks to new revisions, it’s fresher than ever and stands out from its rivals. It’s entertaining on the road too, is bursting with character, and can boast an engine line-up that’s crammed with performative and lively power plants. OSV takes a closer look at what it’s all about with our 2017 Alfa Romeo Giulietta Hatchback review. None of the engines are what you’d call slow, and each of them offers good performance in the city. They all come with the brand’s DNA switch, a feature that lets you adjust the way the car is setup. However, it’s a system that looks as though it might have been rolled out a bit too early. The Dynamic mode, as an example, responds to your inputs with a bit too much enthusiasm. This could prove to be a nuisance in heavy traffic. However, handling on the whole is good. Body lean is at a minimum, while there is plenty of grip on offer. The suspension would benefit from being softer, especially on the more expensive trims, but overall ride quality is acceptable. Just be careful for the larger bumps – but then you already knew that! The engine range kicks off with a 1.4-litre petrol that can get you from a standstill to 62mph in 9.4 seconds. A 148bhp MultiAir variant can do the same dash in 7.8 seconds, its numbers helped by the addition of turbochargers. The 168bhp variant, meanwhile, can coast its way from 0-62 in just 7.7 seconds. If you want a sportier model, a 1.75-litre turbo engine delivers up to 237bhp, and can go ferociously quick in a straight line. At £30,000, however, it’s expensive and rivals the Ford Focus RS – a car that can produce an extra 100bhp. The diesel range is home to the slowest engine in the line-up, a 1.6-litre unit that gets you from a rest to 62mph in 10.0 seconds. It can be a noisy, bothersome engine that doesn’t really fit the cars character. There is a 173bhp variant of the 1.6-litre engine on offer, and this cuts the 0-62 time down to just under 8.0 seconds. It’s quick, it’s economical, but it’s paired up with an automatic transmission that underwhelms. 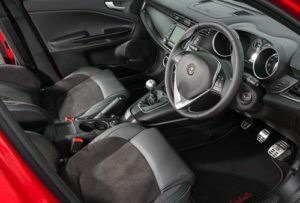 The inside of the Giulietta Hatchback is largely the same as last time. It’s still quiet, but it’s still dogged by cheap plastics here and there that are hardly becoming of a car with this heritage. It’s not quite at the level of the VW Golf, but there are improvements. For example, the introduction of leather upholstery is more than welcome, and helps to lift the interior to a new level of comfort that wasn’t there previously. However, it’s only standard on the pricier trims. The entry level model misses out. The dashboard has been smartened up. The trim is better, the new 6.5” touchscreen is easy to use, and there are less buttons on show. However, you don’t have to look too hard to find the harder plastics. This car is longer than a number of its rivals, but it’s not the super practical. It also makes parking a little tricky, something not helped by the fact that the cheaper models don’t get parking sensors. It’s not easy to get comfortable ether, thanks to a cramped pedal box and a low roof. The car is only available in 5 door form, which means accessing the back seats is easy. However, headroom and legroom are both limited. Storage spaces are dotted around here and there, but they’re not the most useful. The glovebox is small, and so are the door bins. The boot, though, measures 350-litres, which is reasonable in this class. There are four trim levels to choose from – Giulietta, Super, Speciale and Veloce. Standard kit across the range is good, with even the base-level model getting air conditioning, alloys, Bluetooth, a multi-function steering wheel, and the brand’s DNA driving modes. The Super trim ale gets cruse control and dual-zone climate control, while Speciale adds 18” alloys, sportier bumpers and sports suspension. The Veloce model treats you to bigger tail pipers, the fastest engine in the range, and enhanced sports suspension. This car hasn’t been crash-tested by Euro NCAP when it was given 5 out of 5. It scored very well for both child and adult occupant protection, scoring 97% for the latter. 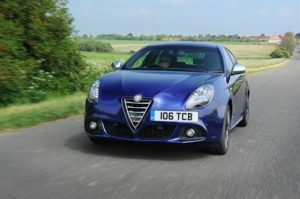 A few obvious safety systems are conspicuous by their absence, including the automatic emergency braking system that many cars in this class have, but the Giulietta Hatchback does get 6 air bags, an immobiliser and central locking. Prices for the new car start out from £18,700 and rise to £28,700. If you prefer to lease, prices start out from around £170. For more information on our lease deals, you can check out our page here. In terms of its running costs, the new car fares well. Road tax is low, and now diesel model returns fuel economy under 65mpg. The cheapest engine to run is the 1.6-litre diesel engine, which is good for 74.3mpg. But the petrols offer a good blend of economy and performance, with the 1.4-litre 118bhp petrol engine able to return 45.6mpg while costing £145 a year in road tax. However, the 148bhp MultiAir variant is even cheaper to run, and can return 51.4mpg. Alfa Romeo’s are always pretty, and this one is no different. It’s a lively, energetic car to drive that manages to evoke memories of Alfa Romeo’s race car heritage, despite only being a family car. If there is one word we’d use to describe the petrol engines, it would be “charismatic” – which is totally befitting of an Alfa Romeo. The pretty face can’t hide the deficiencies of the car for long, and you’ll soon notice the rather poor ride quality. The interior lets the car down. It just doesn’t live up to the name. Let’s see how the car measures up against its rivals in the comparison section of our 2017 Alfa Romeo Giulietta Hatchback review. 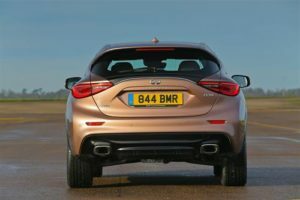 The new Infiniti Q30 Hatchback is yet another stab at the premium market from Infiniti. Their latest offering is a stylish and comfortable attraction for families, but it still has its drawbacks. Infiniti decided to prioritise comfort above driver involvement with this car, so it isn’t the most entertaining hatchback you’ll ever drive. The petrol range opens with a 120bhp petrol and a 108bhp diesel, neither of which feel especially full of life. They also both need to be worked hard, which is ironic when you consider that Infiniti’s chief aim was to develop a car that was as comfortable and relaxing as possible. Opt for either the 2.2-litre 168bhp diesel or the 2.0-litre 208bhp petrol and you’ll get more power, and a more satisfying driving experience. There is also the option of a 1.5-litre diesel engine that’s well suited to jaunts around the town, but which shows its deficiencies once you get it on the motorway. In a word, it’s noisy. Whichever engine you go for, the car is let down by dull handling. However, if running costs are at the top of your list of priorities, the 1.5-litre 108bhp diesel engine is the cheapest to run. It can return fuel economy of 68.9mpg, and costs just £20 a year to tax. However, it doesn’t suit the car’s premium image all that well. The 2.2-litre diesel doesn’t cost much more to run and suits the Q30 Hatchback’s image better. The cabin is luxurious, and Infiniti have done a grand job of making the car as comfortable and smooth on the road as possible. The design is smart, the materials used are plush and look like they’ll survive any test your family can throw at them, while the switch gear contributors to an upmarket atmosphere. Unlike its premium rivals, however, there are some cheaper plastics here and there. The Infiniti Q30 is a practical car. It’s not got as much interior space as the VW Golf, and headroom in the rear is a bit of a letdown. Moreover, thick rear window pillars leave anyone sat in the back feeling a bit cramped. The boot measures 430-litres. The new BMW 1 Series diesel hatchback can’t be beaten in this class when it comes to drivability, while its smart interior should also put it near to the top of your shortlist. If you’re a keen driver on the lookout for a fun way to get your family from A to B and beyond, the 1 Series won’t disappoint. It’s agile, powerful, and handles like a hot hatch. 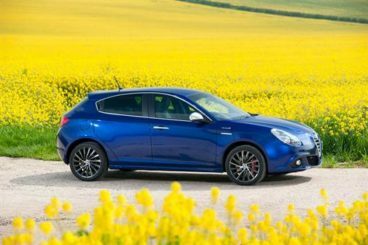 Like the Giulietta, it’s backed by a rear-wheel-drive layout, and indeed the Giulietta is the only car in this class that comes close to rivalling its driving experience. It’s really light at lower speeds, too, which means it’s easy to park. Get it up to speed, and it’s composed and stable. In terms of the engines, if it’s economy you’re looking for, the 116d EfficientDynamics diesel engine makes a lot of sense. It can return fuel economy of 83.1mpg, and is free from road tax. However, 0-62 times of 10.4 seconds are a bit of a drag, and don’t really suit this car’s temperament. However, it’s a smooth enough engine. For beefier performance, the 125d is a sure bet. Like the 120d, it’s powered by a 2.0-litre diesel engine, but delivers more power and can get launch you from a standstill to 62mph in just 6.4 seconds. The 125d and 120d are more expensive to run than the 116 EfficientDynamics model, but thanks to stop-start technology, they’re still efficient and economical. The BMW 1 Series Hatchback isn’t as comfortable as the Infiniti, thanks largely to its sporty handling. However, the interior has been smartened up, and the mixed bag of plastics have been replaced by consistently high quality ones that have spruced up the cabin. Brand new air con controls and dials have also helped to freshen things up inside, but the car misses out on the brand’s iDrive infotainment system. Indeed, the touchscreen tech is not as cutting edge as rivals. 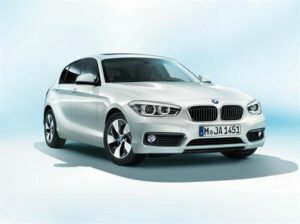 The 1 Series is let down by average practicality. Rear seated passengers will be strapped for room, while the boot measures 360-litres. That makes it slightly bigger than the one in the Alfa Romeo, but the Infiniti boasts a far bigger boot than both. You can fold the rear seats for 1,200-litres, and these seats fold almost totally flat. If you buy your cars based on looks alone, this is the clear winner. However, if ride and finish is important, this might not be for you. It’s unfortunate that an Alfa Romeo is let down by an inferior interior, but that’s the case here. It’s not that the cheap plastics tarnish the Italian brand’s reputation, but it feels like a lack of care has been undertaken. However, there is still a lot to love about this car. The new Alfa Romeo Hatchback has flair, solid engines, and handles almost like a sports car. If you can live with the interior, it’s still a charismatic family choice. Get in touch with a Vehicle Specialist? Fill out the form below with your details, and one of our highly qualified specialists will be in contact within 24 hours. ARE YOU INTERESTED IN GETTING A Hatchback?